For one of our afternoon snack breaks, we decided to try out the fabled Kaya Toast. A coconut and egg sweet spread served on toast, kaya could be compared to our local coco jam. 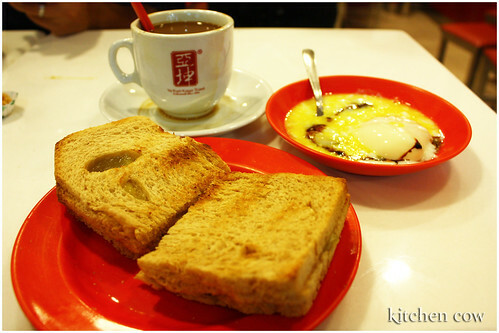 We went off to Yakun Kaya Toast, a kopitiam (coffee shop) chain that boasts of a heritage going back to 1944. 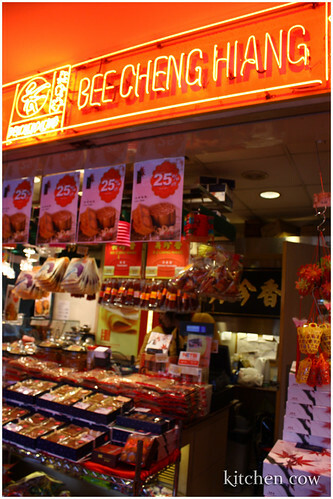 Right next door to Yakun was Bee Cheng Hiang, a Chinese delicacies chain. Going into the stall was a fascinating experience. Rows upon rows of jerky, jars upon jars of floss and stacks of cute, animal-shaped bread dominated the display. 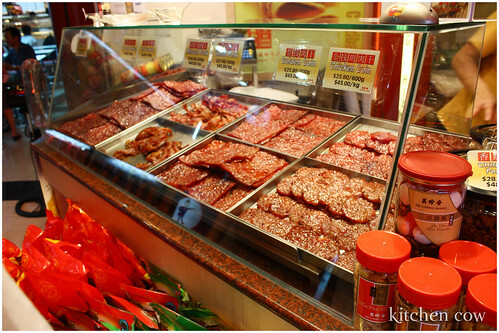 Being the meat lover that I am, we were quick to snag packs of bakkwa, a sweet pork jerky sold in large sheets. We also grabbed a pack of the chili-flavored bakkwa. Both are delicious and are fantastic for nibbling, and for me, is a must-buy. We also grabbed a couple of packets of floss; both the regular kind and a special one mixed with seaweed strips and sesame seeds. Despite the deluge of new tastes and flavors, there are some dishes that absolutely stand out, leaving you craving months after you’ve tried it. One of these is Char Kway Teoy, a stir-fried flat noodled dish. 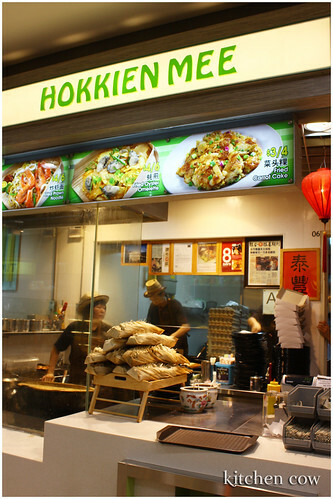 We tried it at Hokkien Mee, an awarded stall at the Ang Mo Kio food court. Smoky, sweet and savory, Char Kway Teoy has a thick, bold flavor that stamps itself in your mind. The delicate flat noodles take in the sauce’s flavor well, and the bean sprouts offer a nice crunch contrast to the soft noodles. You’ll also stumble upon pieces of chorizo and cockles, adding more intense flavor and interesting texture to the dish. To go with the noodles, we also ordered the Fried Carrot Cake. This is something that really confuses me because I don’t see the carrots! We have this theory that what they mean is carrot is actually radish because the texture, not to mention color, is very similar to the vegetable that’s also in the Poppiah. It was soft, bready and white! 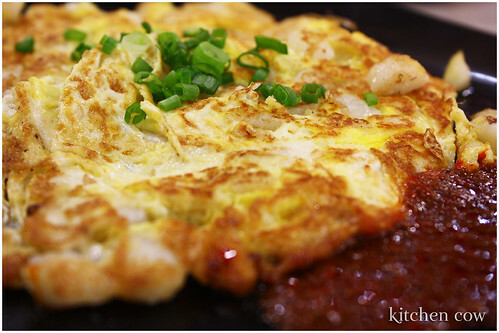 Regardless, it was pretty good, served like an omelet and topped with spring onions and a spicy dip on the side. The texture takes some getting used to but it’s something that’s easy to learn to enjoy. Rabbit was hankering for soup so she ordered a hotpot stew from another stall. It was thick, very flavorful and yummy. 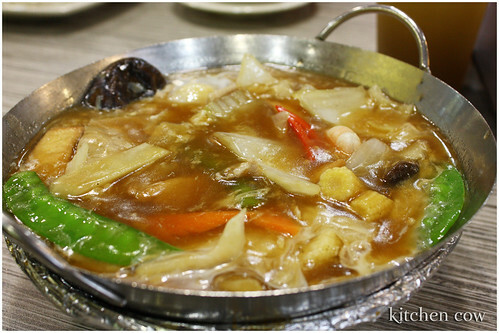 The veggies were crisp and refreshing and the thick broth heartwarming. It definitely fits the comfort food category. Unfortunately, being the useless food blogger I am, I neglected to get the dish’s name and the food stall. 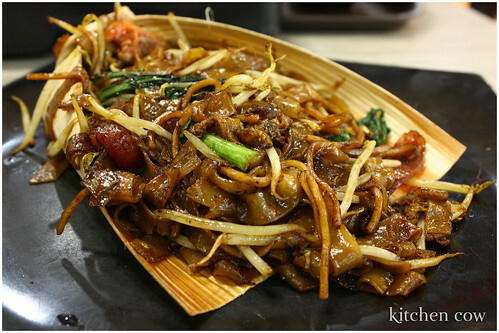 But at the very least, it’s at Ang Mo Kio, I think somewhere across the room from the Hokkien Mee food stall.